The focus of this project is the development of a low-cost miniaturized optical fiber scanner. Optical fiber scanning involves the use of an optical fiber cantilever scanned in one or two dimensions to project light out of the end of the fiber to form an image. In addition to image formation and microdisplay applications, image acquisition is also possible with the addition of a photosensor. To acquire an image, the light projected out the end of the fiber is reflected from objects to be imaged and measured with the photosensor in time series. Because the motion of the fiber is predictable, the reflected light intensity measured at the photosensor can be correlated with position, and a two-dimensional image created one 'pixel' at a time. In comparison to traditional image projection systems like video projectors or competing scanning technology such as MEMS mirror scanning devices or the like, fiber scanning technology offers many advantages. The small mass of the microfabricated fiber scanner allows higher scan angles at video rates (fiber scan at 10-50 Khz) than mirror scanners. Fiber scanners also have a smaller 'footprint', taking up less space and can be conveniently packaged into a small (<3 mm) diameter tube. Applications of the micro-optical fiber scanner include head mounted displays (HMDs) such as the virtual retinal display (VRD), highly portable computer/video projectors, and high-resolution handheld displays. Non-image-based applications for the fiber scanners, such as optical switches and optical multiplexers, are also being considered. When used for image acquisition, the fiber scanner has numerous applications in the areas of medical endoscopy and other remote imaging methods, where the millimeter package diameter size allows exploration into areas previously untouched by traditional methods (http://www.hitl.washington.edu/research/endoscope/ ). A sample image formed with the macro-sized version of the fiber optic scanner can be seen below. At the heart of this micro-optical fiber scanner lies a single micromachined optical fiber optimized for its dynamic properties to maximize scan frequency, fiber tip displacement, and/or angular field of view. Currently further optimization of the mechanical properties of the scanner are underway. Future plans include improved collimation of the exiting light from the fiber, and further system integration of electromechanical actuators , photosensors, and the fiber cantilever itself into an easily fabricated, low cost package. 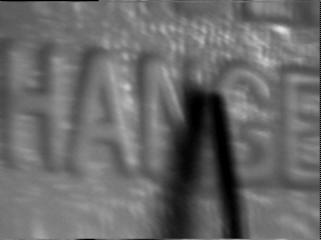 The letters in this fiber scanner image are 2.5 mm high. Microscope image of the Micro-optical fiber scanner. The fiber scanner is driven in one dimension with a piezoelectric (not shown), producing a line scan. Fiber is vibrating at 40.4 KHz with an angular displacement of 80 degrees. Singlemode fiber with a cladding diameter of 125 micron was used. 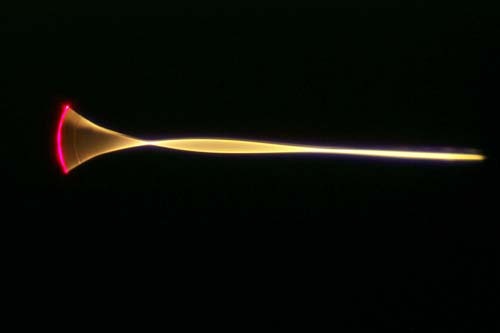 Tip diameter of the fiber, where red laser light is exiting, is approx. 10 microns.